I hope your weekend was festive! Our plans were interrupted by the husband not feeling well. Sad face. This meant I didn’t get to share my Northern Irish Welcome Scones with all our friends! Trust me guys, you would have liked these. I was even going to use my blueberry jam from the farmers market that is simply amazing with these. That’s pretty significant because the market doesn’t start back up for another 6 weeks, and I only have about 1/2 a jar of this stuff left! It’s getting serious. Using this jam for the scones would have been a big sacrifice. Back to St. Paddy’s. I only remembered a few weeks ago that I kept a blog while I lived in Northern Ireland! My post on St. Patrick’s Day in Ireland isn’t particularly enlightening. I evidently wasn’t super impressed. Sure, we went to the pub and had some beer, but I don’t remember thinking it was a whole lot different from other nights at the pub. However, a couple years ago I spent St. Patrick’s Day in New York City and it was way crazier than Ballycastle, Northern Ireland. [It was a really bad time to experience the city for the first time and to walk the city for an hour or so with a rolling suitcase.] Which I guess makes sense since St. Patrick’s Day began in the United States and there are more people of Irish descent living in the US than the entire population of Ireland. For more fun facts you didn’t know about St. Patrick’s Day, here’s a list. The more exciting part of this holiday (as with many holidays) is the food! I thought and thought about what I wanted to make aside from scones to celebrate my faux Irish roots. 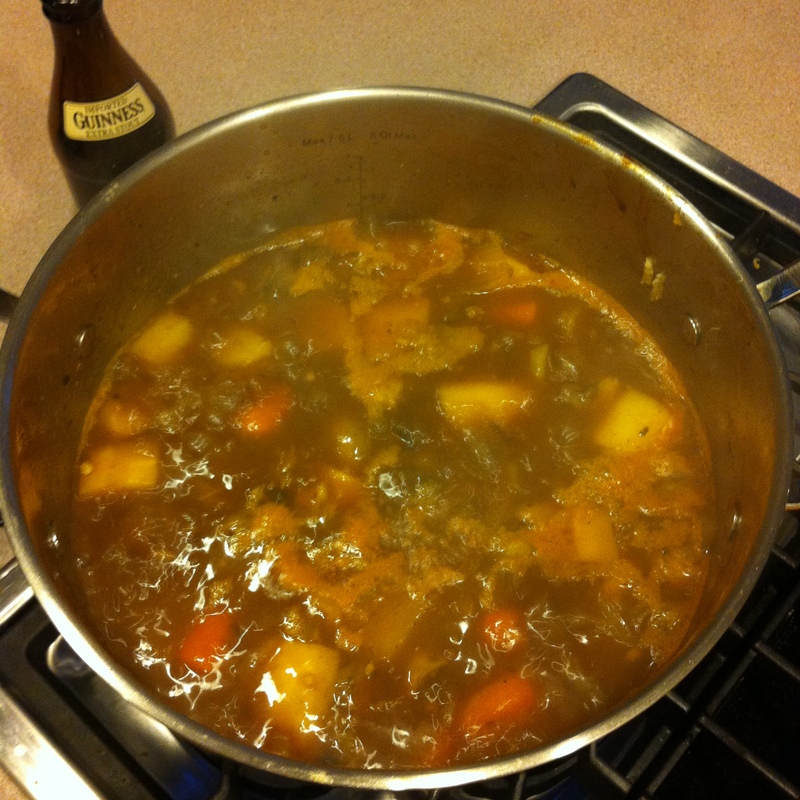 I decided very quickly that it had to be the classic Guinness stew. No sugary Bailey’s dessert, nothing dyed with green food coloring, no layers of jello to look like a rainbow. Sure, that’s all festive and probably tasty, but it’s not for me. I prefer something a little less processed. Besides, Bailey’s is amazing in coffee or hot chocolate and WAY easier than baking something. 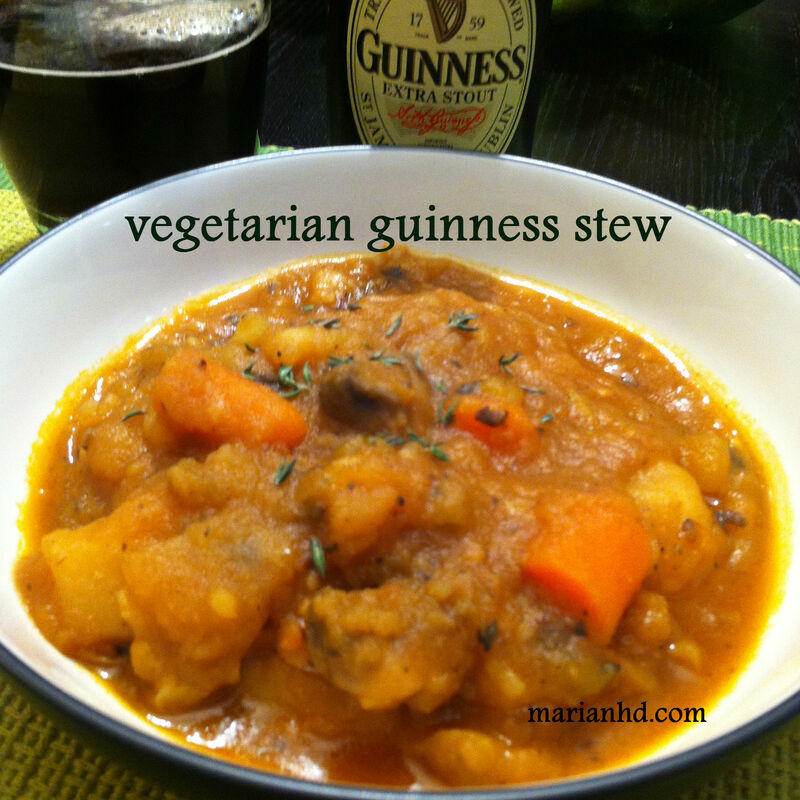 I researched a vegetarian Guinness stew and a traditional Guinness stew and combined the best of both. I also decided to add miso paste to mine. That’s not traditional, to be sure, but the husband was disappointed that our Guinness stew wasn’t going to have beef in it, so I wanted to add something with some extra umani. I took that cue from Michael Pollan’s Cooked. It worked, too! The stew tastes so rich and satisfying. The husband had two bowls. This stew may become a Meatless Monday regular beyond March 17th! 1. Peel the potatoes, carrots, and parsnips and chop them into large chunks. 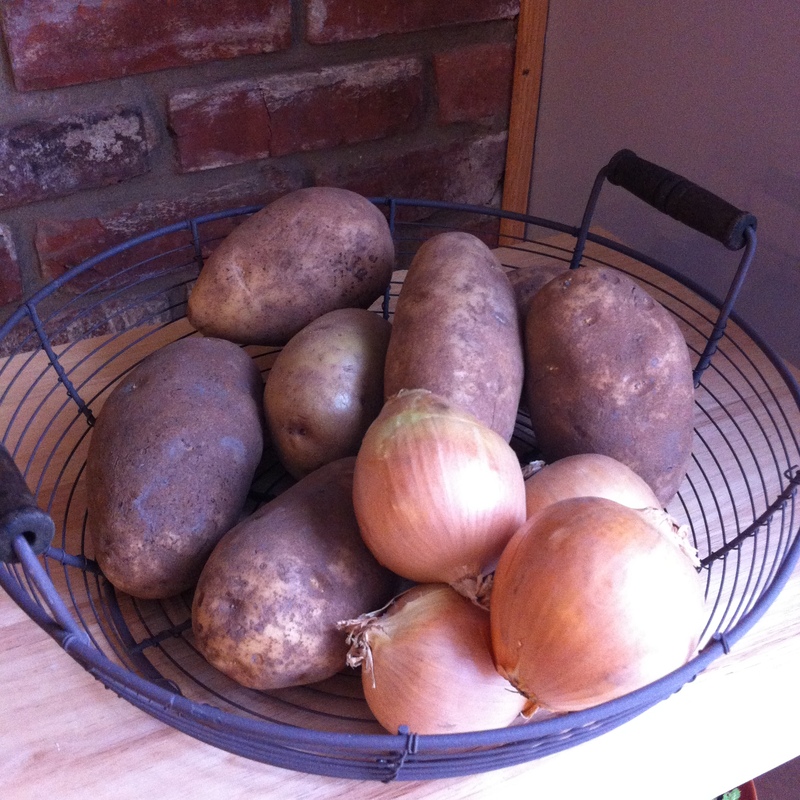 Set them aside in a large bowl. 2. 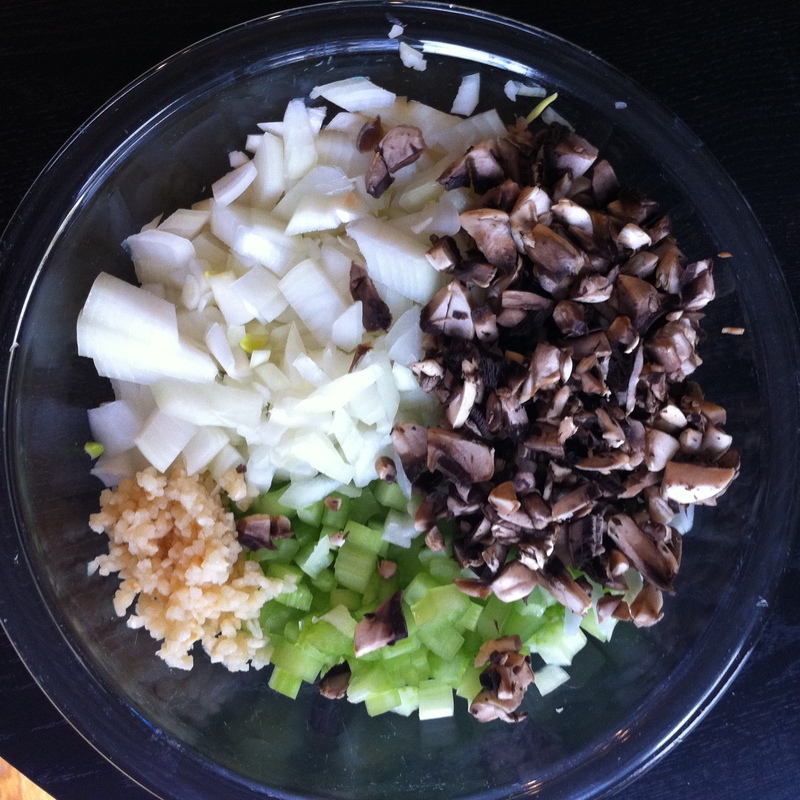 Finely chop the celery, 2 onions, and 4 of the mushrooms and mince the garlic. 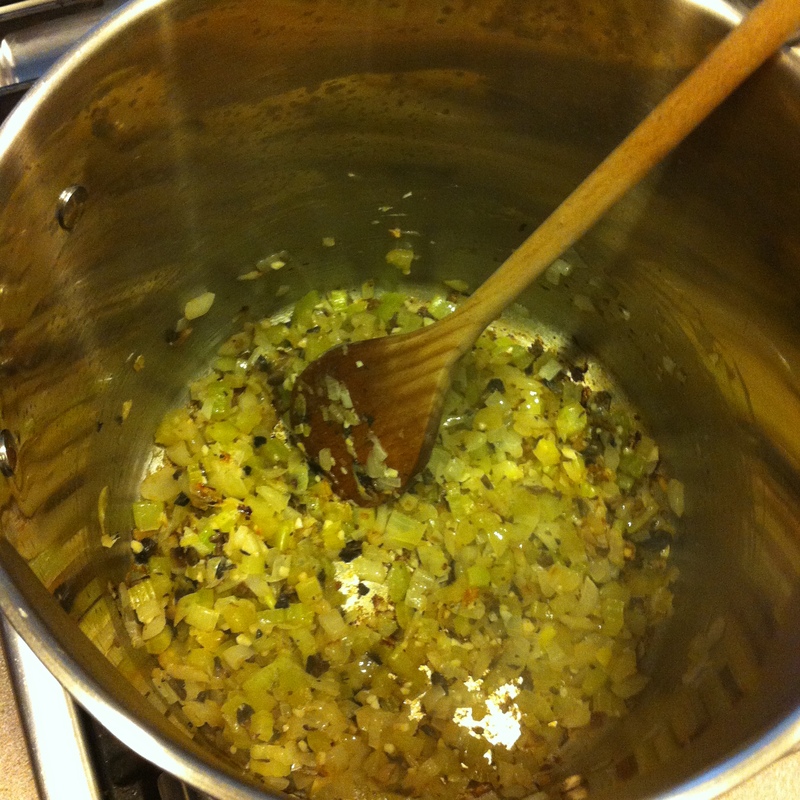 Heat the olive oil in a large soup pot (I mean really large) and add the finely chopped veggies and the minced garlic. Cook for about 10 minutes, letting the onions start to get brown. 3. While the finely diced veggies are cooking, roughly chop the rest of the mushrooms and onions. 4. Stir in the flour with the cooking veggies and cook for 2 more minutes. It’s ok if the onions start to burn a little or stick to the bottom of the pot a bit. Just lower the heat a little and keep stirring. Add the Guinness and use it to deglaze the pan, scraping up all the yummy bits that might be stuck to the bottom of the pot. 5. Add the rest of the ingredients and bring it all to a boil. Lower the heat to keep the pot simmering uncovered for 45 minutes (see photos below). Your home will smell amazing starting around minute 3. Stir occasionally. 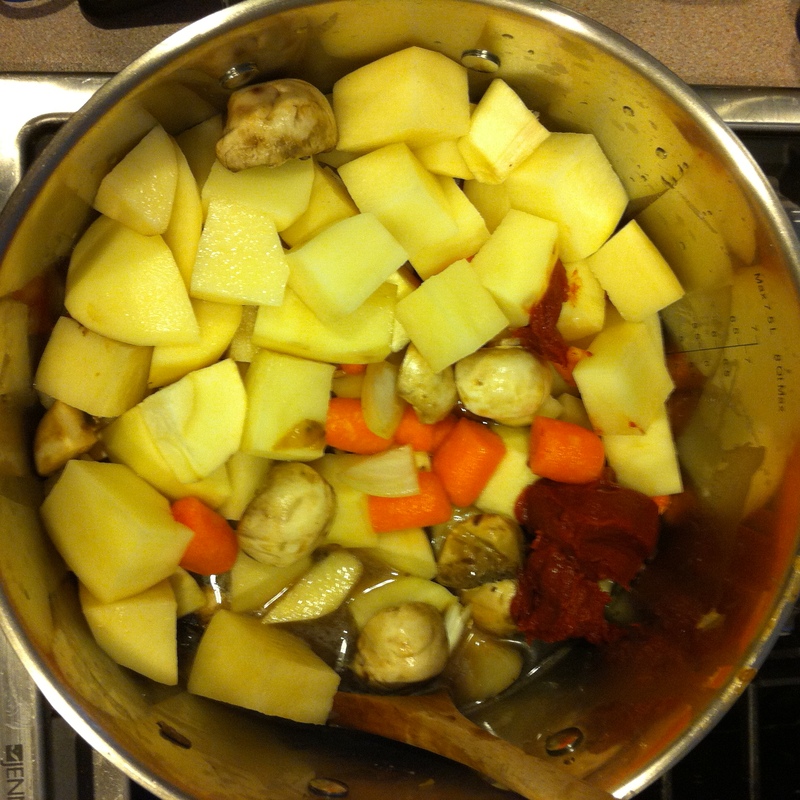 The stew is done when all the vegetables can easily be pierced with a fork. Garnish with fresh thyme and serve. Cooking uncovered will allow lots of water to cook off, reducing the stew down. 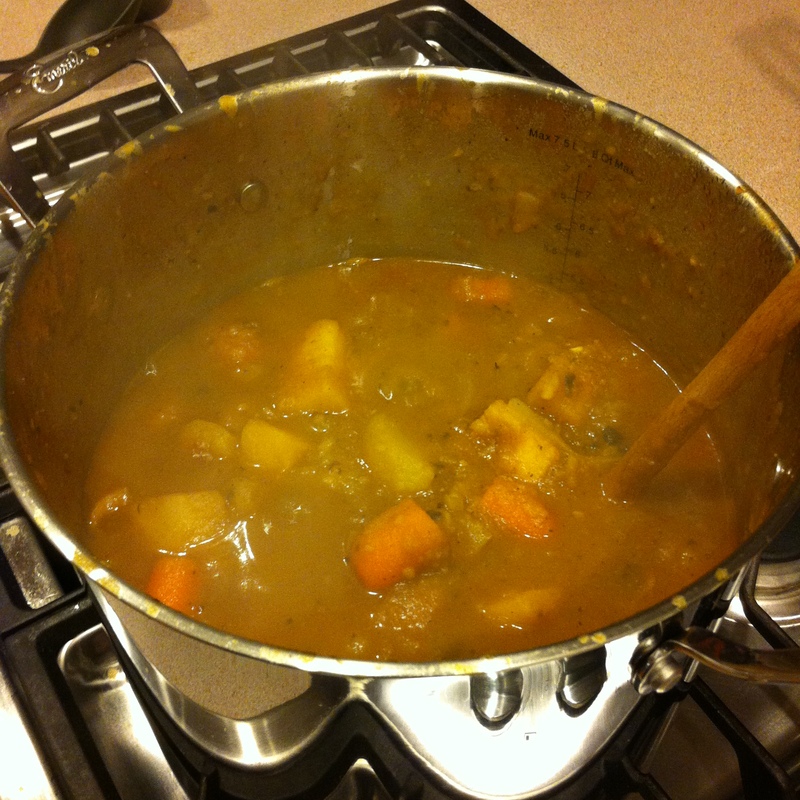 Notice the liquid level difference between the beginning and the finished pots of stew. 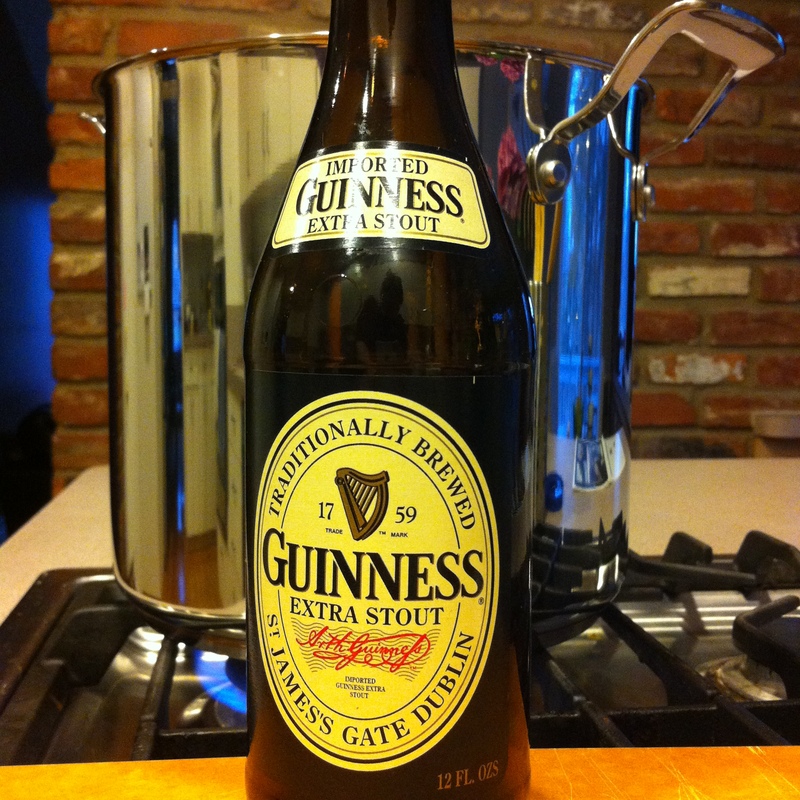 March 24, 2014 EDIT: A Twitter follower accurately pointed out that Guinness is not completely vegetarian-friendly because isinglass (a fish product) is used to help remove leftover yeast. To read more about this controversy and read correspondence from Guinness themselves, check out this HuffingtonPost article. Happy St. Patrick’s Day to you, too! I hope you’ll enjoy the stew. Please stop back and let me know how it works for you. Thank you for the follow! I hope you find more good recipes here.